Clusters of roses and carnations comprise the field design of this matched pair of incomparably beautiful Aubusson runners. Beautiful and Quite Refined Antique French Aubusson Runner Rug, Origin: France, Circa: Nineteenth Century, (one of a pair, along with 2854) – This antique French Aubusson rug celebrates centuries of tapestry weaving tradition. The designs are elegant and stately, reflecting rococo or Napoleonic design elements. These designs draw on Greco Roman design elements to reflect their aristocratic beginnings. 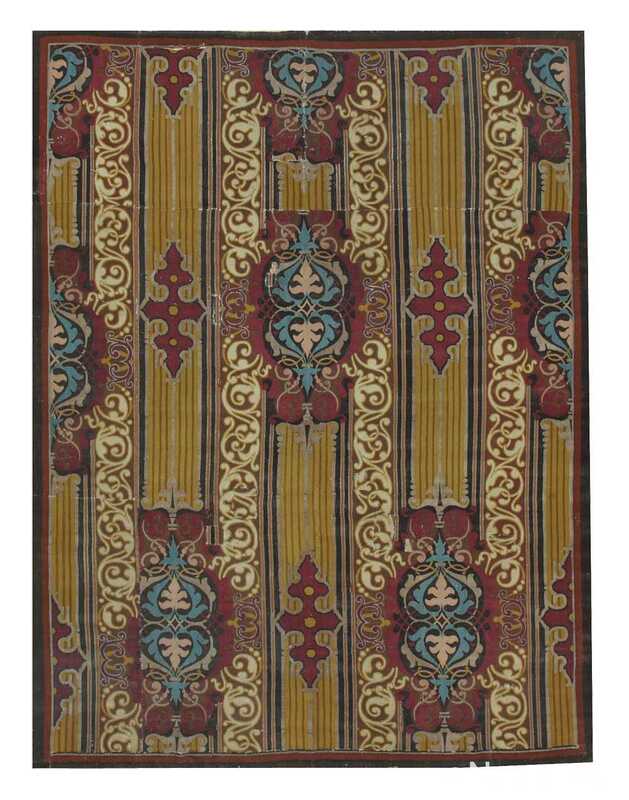 The same design elements used in this runner rug are reflected in French architecture and furniture design. This classic French Aubusson runner rug brings a touch of grandeur and eloquence to any decorated room. The beautiful antique French rug features two messy bouquets, reminiscent of the French countryside. The soft colors of the flowers against an elegant ivory background are accented by splashes of red. One might note that both bouquets, although similar, are not identical. The antique French Aubusson runner rug is directional with both bouquets arising from a defined bottom delineated by an element resembling a scrolled Greek urn. 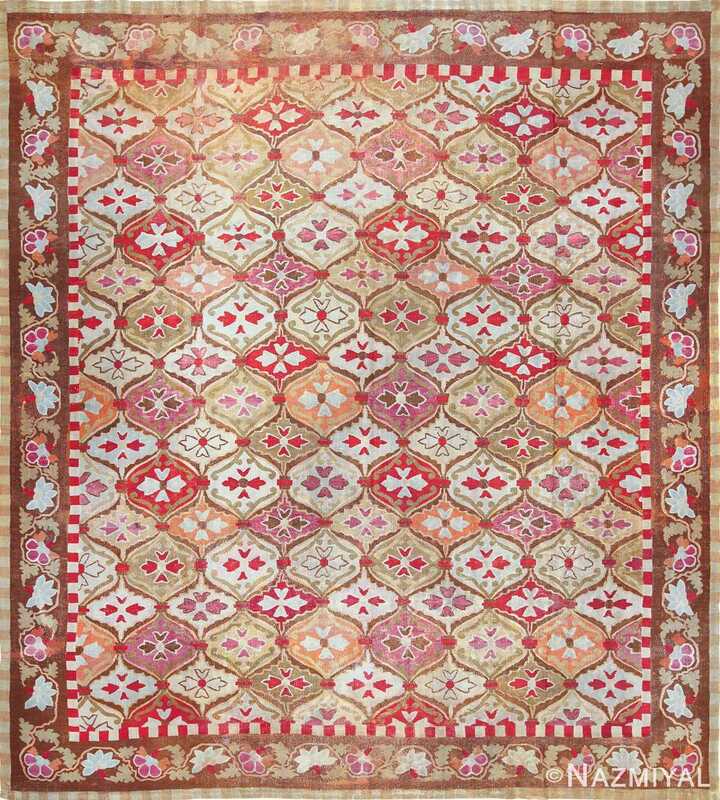 Although the antique rug does not have a defined line of symmetry, is still has a sense of balance that is achieved through the weight and placement of the design elements. It combines hues from light to dark that combine in such a way as to create depth and shadow in the flowers and vine work on the edges. The subdued colors of the antique French Aubusson runner rug give it a sense of lightness and airiness. The main border is denser on the ends than the long the edges, giving it spatial definition. Occasionally, the flowers break through the line that separates the field of the rug from the main floral border. This gives it an informal and meandering quality, reminiscent of a field of wildflowers in the French countryside. This antique French Aubusson runner rug takes you to a stroll through the French rural countryside and a trip back in time to the extravagance of the time of Louis XV. This peaceful, pastoral rug complements any traditional design, or any area that needs an informal feeling and a breath of summer breezes. European and Asian designs converge in this exceptional 18th century Aubusson carpet decorated with a strong repeating pattern and bold Bohemian colors.